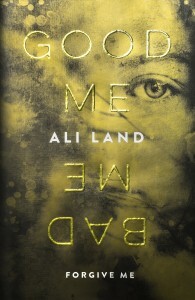 January’s selection of gripping crime novels has a troubling message for the way we live now. I have always believed that most real violent crime has its roots in failed relationships, whether parental, sibling, peer group, or couples. 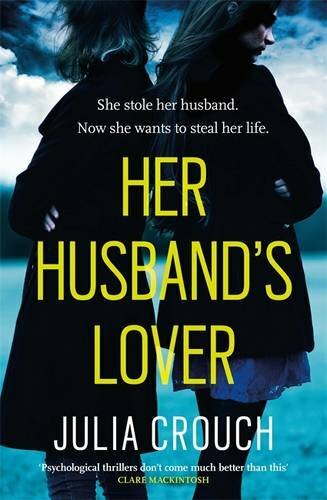 It’s not surprising, therefore, that crime novels should deal with abusive relationships. What is so troubling at the moment is that the fundamental story of the most popular in the genre is that women are victims, if not of the men in their lives, then of their own biological or psychological demons, which go on to make victims of other people as well. Julia Crouch’s pacy thriller about a woman terribly injured when her car crashes as she’s being chased by her abusive husband in his Porsche has twists galore and is full of treats, but both the women in it are presented at different stages as drunk, drug addicted, spendthrift, hopeless, mad and vengeful. Lou, the injured party, has nearly everything going for her: beautiful, brilliant, and high achieving in her work, she’s married to a rich and successful man, with whom she has two children. Finding motherhood hard, she blunts the edges of her distress with large quantities of wine and soon discovers that her husband has a pregnant mistress. Sophie, a once successful model who used cocaine to deal with the horrors of that life, sees Lou inheriting everything after the fatal car crash, while she and her baby face a life of poverty. This might be alleviated in a small way by going on benefit, but Sophie can’t bear to do that and is determined Lou should pay. Trying to sort things out is a charming young man, himself the son of a heroic single mother we never meet. The writing is excellent, presenting vivid landscapes and character studies, and the plot swings our sympathies first one way and then the other. 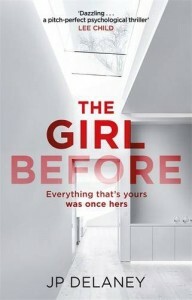 J. P. Delaney appears to be writing a classic fem-jep novel, but The Girl Before is as tricksy as its title. 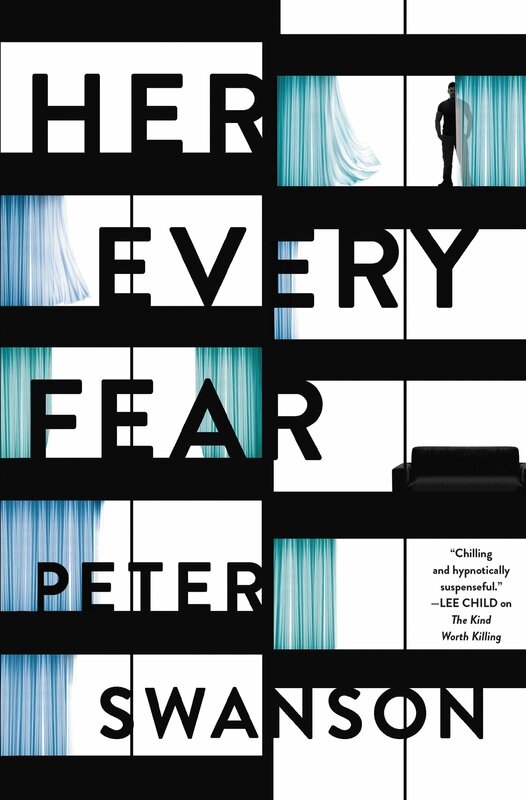 A control freak of an architect, whose wife and child are dead, creates a modernist masterpiece of a small North London house. Anyone who wants to rent it has to fill in highly intrusive questionnaires and promise to abide by long lists of rules. A computer controls everything in the house, punishing the tenant (by, for example, shutting off the water) if the rules have been broken or any untidiness or other backsliding has been detected. The narrative alternates between the time when Emma lives in the house with her slightly hopeless boyfriend and the later period, when Jane has it. Both women suffered trauma before they were accepted as tenants: Emma had been raped; Jane’s baby was stillborn. The two narratives echo and reflect each other, building the tension as Jane learns that Emma died in the house, perhaps from suicide, perhaps murder. Slick, clever, and – again – fast moving, The Girl Before deals not only with women in danger but also with two apparently ineradicable male terrors. In spite of that, or perhaps because of it, the only dead are women. I didn’t look into J. P. Delaney’s real identity until I had finished the novel. When I did a tiny bit of investigation, I was not surprised to find that this is said to be the pseudonym of a successful male novelist. Ali Land’s Good Me Bad Me is an interesting and convincing exploration of traumatized adolescence. Milly is being fostered by a psychologist as she waits to give evidence against her mother in court. A serial killer of abducted children, Milly’s mother forced her to watch the torment she inflicted on her victims. Milly eventually went to the police and is, not surprisingly, riddled with guilt. She betrayed her mother; she betrayed the children she didn’t save; she is a bad person. She is also tormented by Mike’s daughter, who is her own age and attends the same school. Hyper-vigilant like all children of abusive parents, Milly has an excellent insight in other people’s secrets and behaviours. She knows when she is being manipulated and she is herself a brilliant manipulator of other people. Her voice is beautifully rendered and her own behaviour is absolutely convincing. This is a most impressive novel. 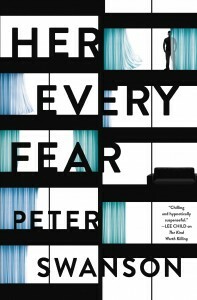 Peter Swanson offers Kate, a victim of terrible anxiety and of serious past violence. Everyone in her life is surprised when she’s brave enough to ignore her terrors and accept a proposed house swap with a cousin she has never met. While he takes on her small North London flat, she moves into his gloriously sited and appointed flat in old Boston. On the day she moves in she discovers that her nearest neighbour, a single young woman, has just been murdered. She might have died just after Kate’s cousin flew to London, or it might have happened just before he left the States. On the opposite side of the courtyard lives a man who was obsessed with the woman who has died. An old friend of hers, traumatized by her death, loiters outside the building to accost Kate when she walks out into the street. Again tension builds effectively as Kate and the reader discover more about the dead woman and the three men in her life. 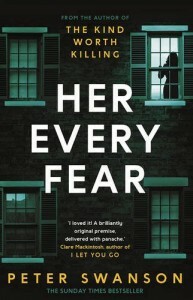 As in J. P. Delaney’s novel, male paranoia is at the root of the violence inflicted on the women who have the bad luck to encounter one particular psychopath. All these novels are effective, well researched, well written and absorbing. But I do long for the day when novelists move on to write about women who have learned to manage their own demons, who bestride their lives and their worlds like the powerful, autonomous human beings so many are. The best fiction reflects the life we live but it also feeds the atmosphere in which we live. 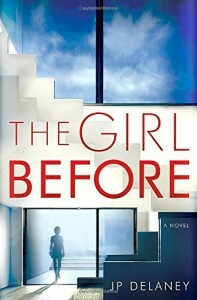 If readers continue to spend huge amounts of money on novels about women as victims, publishers will continue to commission them and writers write them – and more boys will grow up thinking it’s OK to victimize women and more girls will grow up without the sense that it is their right and their responsibility to find a way to live their life as they choose.